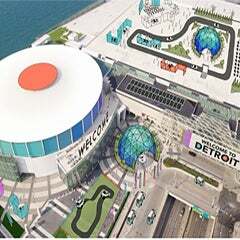 DETROIT, MI (19 July 2018) – The Detroit Regional Convention Facility Authority (DRCFA) and Cobo Art are pleased to announce the acquisition and unveiling of two large scale original paintings created by emerging Detroit-based artist Nic Notion. Pictures are available here. The works entitled AMERIXAN NOTION BLACK 1 and AMERIXAN NOTION BLACK 2 are now on display on the fourth floor of Cobo Center, expanding a broad collection that includes works by internationally respected artists such as painters Tyree Guyton and Gilda Snowden along with sculptors Ed Hamilton, Robert Sestok, Sergio De Giusti, and Carl Milles, among others. Notion’s additions to Cobo Art’s permanent collection offer an abstract depiction of Detroit’s current transformation from a metaphor for rubble and decay into an example of urban revival. The two female figures featured are a reference to the women on the seal of the Detroit flag. The seal is a representation of the 1805 fire that destroyed the city. The figure on the left weeps over the destruction, while the figure on the right gestures to the new city that will rise in its place. Through its DRCFA Art Foundation, Detroit’s Cobo Center joins major convention centers throughout the country featuring public art including cities such as Chicago, Nashville, Pittsburgh and Washington D.C. Cobo Center’s curator is Maureen Devine. 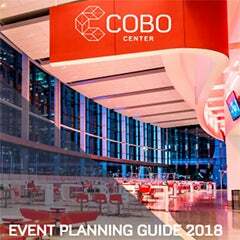 Located downtown on the beautiful Detroit Riverfront, Cobo Center is one of the largest convention centers in the nation offering 723,000 square feet of exhibit space. Nic Notion studied broadcast arts and communications at Wayne State University. His work is inspired by Jean-Michel Basquiat and Cézanne and typically combines elements of street art with dynamic abstract canvas compositions tackling subjects including racial division, gentrification and urban decay. Notion’s Amerixan Notion series debuted with his solo exhibition entitled the same, at PLAYGROUND DETROIT gallery in Detroit in February. 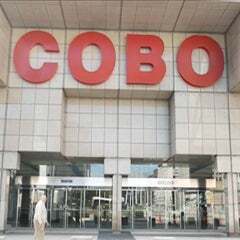 On 9/15/09, operational control of Cobo Center transferred to the Detroit Regional Convention Facility Authority, under a collaborative agreement by the Michigan State Legislature, the City of Detroit, and Wayne, Oakland and Macomb counties. Each of these entities has an appointed member on the DRCFA Board. Larry Alexander is the appointee of the Governor of the State of Michigan and serves as Chairman of the Board. For more information visit: http://www.drcfa.org/. The DRCFA Art Foundation is a 501(c)(3) nonprofit organization. It was created on July 31, 2015.